THERE is a growing preoccupation over the monetary policy stances taken across the globe. This piles pressure on central bankers to keep a tight watch on asset bubbles and high debt levels, and to bolster market confidence while ensuring their policies support the kind of growth their country wants. The reason, in short, is because world markets have trouble letting go of the flood of cheap money from the US Federal Reserve’s quantitative easing (QE) programme that had driven prices higher across several asset classes. Global equities markets roiled when the US’ QE3 ended on Oct 29 last year but quickly found respite in the Bank of Japan’s QE stimulus announced on Oct 31, 2014. The European Central Bank (ECB)’s €1.1 trillion (RM4.54 trillion) QE programme announced on Jan 22 was signalled last November. But monetary policy alone is not enough to deliver economic growth and is more often than not a choice between taxing borrowers, who want lower cost of debt, or taxing savers, who want higher deposit yields, observers says. “Monetary policy can create the basis for growth, but for growth to pick up, you need investment. And for investment, you need confidence. And for confidence, you need structural reform,” ECB president Mario Draghi reportedly said on Jan 22. In the same vein, Malaysia — which some observers reckon has to rely on monetary policy to support growth because its fiscal options are limited by tight finances in a period of falling oil revenues — should be focusing on delivering sustainable growth. Rather than just meeting short-term headline fiscal numbers, policymakers should put in place and communicate well measures to shore up growth and bolster confidence, experts say. “Communication is important to boost local consumption because consumers and businesses, at least the more mindful ones with a better credit profile, are likely to conserve cash rather than spend or invest until they are more confident,” a local analyst says. Concerns over weaker income growth, falling real (inflation-adjusted) wages and gloomier job prospects are weighing on consumer sentiment and “is translating into less willingness to spend” while business confidence is “weaker amid the ringgit’s sharp depreciation and the falling oil prices”, CIMB Research’s economist Julia Goh told clients in a Jan 30 note, citing a 4Q2014 dip in the Consumer Sentiment Index (CSI) and Business Conditions Index (BCI). She did, however, add that the government is intensifying efforts to support private consumption by giving priority to local contractors to carry out reconstruction works, promoting “Buy Malaysian products” via import substitution, increasing the frequency of nationwide mega sales, extending shopping hours, accelerating the promotion of domestic tourism through competitive domestic air fares and encouraging the private sector to capitalise on the benefits of the Asean Economic Community (AEC). For now, a weaker ringgit “may be one of the few [policy] options to support exports and growth”, says Bank of America Merrill Lynch Asean economist Chua Hak Bin. “The government should also focus on reviving FDI [foreign direct investment] and tourism to help support growth,” he says. “Loosening prudential measures on property and credit will only encourage excessive leverage, with household debt (as a share of GDP) already the highest in Asia,” Chua adds. Executive chairman and chief economist of RHB Research Institute Lim Chee Sing also reckons Malaysia can promote “tourism, including medical tourism, and regional education services aggressively, given that the ringgit has depreciated significantly vis-à-vis the US dollar and other currencies”. Executive director and regional economist of CIMB Research Pte Ltd Song Seng Wun also reckons that Malaysia can and should do more to attract investments in export-oriented activities. The latter include electronics, medical devices, aerospace and machinery. “An example would be last year’s joint venture between Singapore’s Temasek Holdings and the Penang Development Corp to develop the Penang International Technology Park and BPO Prime in the Batu Kawan area,” Song says, adding that other Malaysian states such as Melaka and Johor have also been successful in attracting foreign investment and tourists. Acknowledging the potential limitation of both fiscal and monetary policies, RHB’s Lim says Malaysia can also shore up economic growth by accelerating the implementation of infrastructure-related projects that are already underway and/or bringing forward the implementation of projects that are in the advance stages of planning. To be sure, accelerating some high-impact projects with high import content could come at the cost of a slimmer current account surplus or Malaysia seeing its first current account deficit since 1997. However, a current account deficit on its own is not necessarily bad news if the economy is growing strongly and confidence is high, historical data shows. Official statistics show that Malaysia’s economy was growing at an average of 9.3% in the decade between 1988 and 1997, during which the current account was only in surplus in 1988. Malaysia faced the feared “twin deficit” situation — having both fiscal and current account deficits — from 1989 to 1992, during which GDP growth was between 8.88% and 9.55%. Public debt-to-GDP levels were high in those four years but fell from 85.47% in 1989 to 64.38% in 1992. Despite inflation being as high as 4.8% in 1992, real interest rate was still positive at 3.23% with 12-month fixed deposit rates at 8.03%. At its peak, Malaysia’s public debt-to-GDP ratio was 103.37% in 1986, but the federal government debt stood at RM74 billion, a mere 13% of the RM569.3 billion at end-September 2014. From 1980 to the 1997/98 Asian financial crisis, the ringgit was doing well against the US dollar, with every ringgit able to buy 36 to 47 US cents, compared with 28 US cents currently. This is not very far above the 26 US cents when the ringgit was pegged at RM3.80 to the greenback from September 1998 to June 2005. 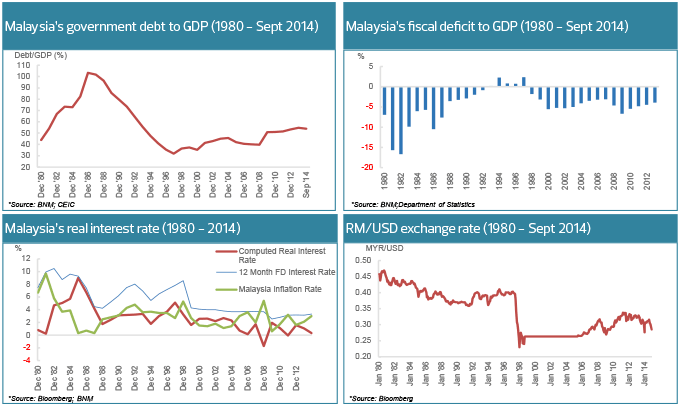 Also during these years — after the introduction of Malaysia Inc in 1981 and the privatisation policy in 1983, which increased the private sector’s role in the country’s economic development — the government’s non-ringgit-denominated debt fell sharply from RM28.28 billion in March 1987 to RM9.06 billion in June 1997. According to data on the Prime Minister’s Department’s Public-Private Partnership Unit (UKAS) website, Malaysia saved RM161 billion in capital expenditure and an additional RM7.79 billion in annual operating expenditure (RM25 billion over 25 years) from the privatisation of some 500 projects between 1983 and April 2009. The privatisation of 58 government agencies also transferred 113,440 government servants from the civil service’s payroll to the private sector’s. To its credit, the government’s non-ringgit-denominated debt, which spiked again post-1997 to peak at RM40.19 billion in September 2003, has been gradually brought down. At RM16.08 billion as at September 2014, it is still near the June 1997 lows — a comforting factor amid growing concerns over high public debt levels and the extent of contingent liabilities. 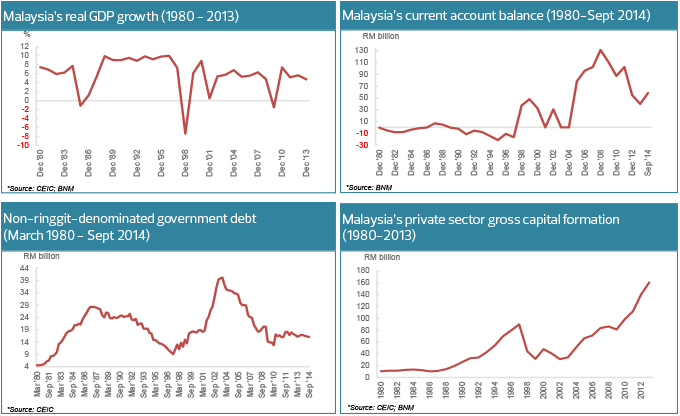 Observers say Malaysia still has assets that it can employ to strategically bring down public debt levels. By 1997, the public debt-to-GDP level had fallen to only 31.91% with federal government borrowings at RM89.92 billion, Bank Negara Malaysia and CEIC data shows. The lower public debt-to-GDP level amid the 1997/98 Asian financial crisis — when private corporations had overgeared — was a saving grace despite Bank Negara’s reserves levels being much lower than what they are today. Malaysia’s quasi-government funds such as the Employees Provident Fund (EPF) also did not have as big a fund size as today, another factor that is lending support to the local equities and bonds markets. “It is also interesting to note that the government is encouraging government-linked companies and government-linked funds to invest domestically,” Maybank Investment Bank chief economist Suhaimi Ilias says in reply to questions on the limitations of Malaysia’s monetary and fiscal policies. “It is also clear that the government is not cancelling or deferring major infrastructure projects, and some of these projects are funded via special purpose vehicles like MRT Corp and Prasarana Malaysia Bhd and undertaken through private finance initiatives,” he says. While activities in the oil and gas industry will be affected by the plunge in crude oil prices, Suhaimi says the Malaysian Investment Development Authority’s investment approval rate “is encouraging as 2014 was the strongest year in terms of approved manufacturing investment since 2008, which should translate into actual investments this year onwards”. If he is right, a marked rise in investment activity would shore up confidence and lead to better-than-expected growth. Citing the unchanged development expenditure of RM48.5 billion and the RM5 billion financing scheme for small and medium-sized enterprises in the services sector in her note, CIMB’s Goh says the government realises the importance of domestic investment in supporting the economy and the multiplier effects. As it is, the cautious economic outlook may mean the multiplier effects may be lower than in the past, she adds. That said, the multiplier effect could be better than expected if the right policies are put in place to shore up growth and, in turn, boost consumer sentiment and business confidence.